This study aims to develop a water turbine suitable for ultra-low heads in open channels, with the end goal being the effective utilization of unutilized hydroelectric energy in agricultural water channels. We performed tests by applying a cross-flow runner to an open channel as an undershot water turbine while attempting to simplify the structure and eliminate the casing. 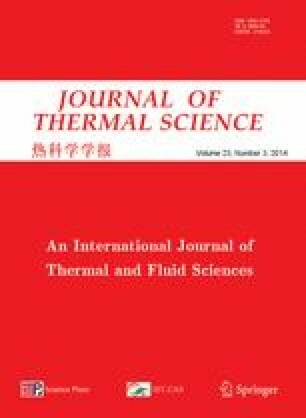 We experimentally investigated the flow fields and performance of water turbines in states where the flow rate was constant for the undershot cross-flow water turbine mentioned above. In addition, we compared existing undershot water turbines with our undershot cross-flow water turbine after attaching a bottom plate to the runner. From the results, we were able to clarify the following. Although the effective head for cross-flow runners with no bottom plate was lower than those found in existing runners equipped with a bottom plate, the power output is greater in the high rotational speed range because of the high turbine efficiency. Also, the runner with no bottom plate differed from runners that had a bottom plate in that no water was being wound up by the blades or retained between the blades, and the former received twice the flow due to the flow-through effect. As a result, the turbine efficiency was greater for runners with no bottom plate in the full rotational speed range compared with that found in runners that had a bottom plate.